Much of the area of contemporary Mauritania has been long inhabited by nomadic Berber people, with its south-eastern area falling within the ancient Ghana Empire. From 1000 years ago, successive waves of Arabic invaders dominated the region, beginning with the Almoravid dynasty. From the late 19th century, imperial France began to take over the territories of present-day Mauritania, making it part of French West Africa in 1920. It gained independence as the Islamic Republic of Mauritania in 1960. A one-party state throughout the 1970s and 1980s, the country had a number of military rulers and experienced regime change by military coups, with additional periods of ethnic unrest. After a failed attempt to annex land in the neighbouring Western Sahara, Mauritania withdrew its claims in this regard in 1978. It began to adopt elements of democracy in 1992, with the first fully democratic presidential elections in 2007, but saw further attempted and actual military coups in 2003, 2005 and 2008. Traditionally, nomadic livelihoods dominated. Severe droughts in the 1970s and 80s led to many people migrating to the coastal cities, but agriculture, particularly livestock, still supports a majority of the population. Iron ore mining accounts for around half of export income. There is also some gold and copper mining. Offshore oil was discovered in 2001, but as yet its future economic influence is uncertain. Ports at the capital city, Nouakchott, and the second city Nouadhibou, are important for the export economy and for the fishing industry. Mauritania lies almost entirely within the Sahara desert, with very low rainfall, and is very water-poor. Only the coastal zone sees any significant seasonal rainfall. The only perennial river in the country is the Senegal River, which forms its southern border. The country is dependent on groundwater for virtually all its water supply. Mauritania. Map developed from USGS GTOPOPO30; GADM global administrative areas; and UN Revision of World Urbanization Prospects. For more information on the map development and datasets see the geography resource page. Most of Mauritania is desert, with very low population density. Much of the country has relatively low elevation, with the coastal plain generally less than 50 m above sea level (asl) and much of the interior around 200 m asl, with gentle slopes. In the centre and north there are hilly massifs reaching 400 to 800 m asl, such as Adrar and Tagant. Here are occasional steep cliffs, faulted scarps or inselbergs. In the far south is the alluvial plain of the Senegal River. Much of the rest of the country is largely covered by dune sands. The climate is generally hot and dry, with a Saharan climate in the north and Sahelian in the south. Maximum temperatures exceed 44 °C in May-June, and minimum temperature can go down to 10 °C in January and February. Winds, predominantly north-east, are very frequent and favor the progression of silting. The rainy season is very irregular in time and space. It generally extends over a period of four months, from June to September, with a north-south gradient in rainfall amount ranging from a few millimeters to 450 mm/year. Most of the country receives a rainfall of less than 300 mm/year. There were major droughts in 1984-85 and 1991-92, when rainfall was 35 to 70 percent lower than average (FAO AQUASTAT 2005). 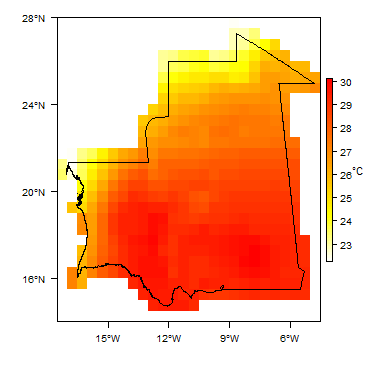 More information on average rainfall and temperature for each of the climate zones in Mauritania can be seen at the Mauritania climate page. The only perennial river in Mauritania is the Senegal River, which forms its southern border. Other rivers are ephemeral and short. The main ephemeral rivers are the Gorgol in the Tagant area, the Garfa and Niorda in the Assaba area, and the Karakoro along the Mali border. In addition to these, there are wadis (smaller ephemeral tributary rivers) that include: Seguelil from Atar at the confluence of Adrar and Amsaga; El Abiod from the south; Khatt depression between Adrar and Tagant; and Tayaret, which is hundreds of kilometers long and is purported to be the oldest stream network, dating back to the Holocene (Friedel 2008). There are two primary lakes and numerous sebkhas (ephemeral lakes), such as Lake Aleg, which receives water from the Ketchi wadi, and Lake R’Kiz, which receives water from the Senega River (Friedel 2008). There are a few small dammed reservoirs in the centre and south of the country. Perennial springs occur in a few isolated areas. Little information is available on the locations of stream gauge stations and/or streamflow discharge measurements. Major surface water features of Mauritania. Map developed from World Wildlife Fund HydroSHEDS; Digital Chart of the World drainage; and FAO Inland Water Bodies. For more information on the map development and datasets see the surface water resource page. Soil Map of Mauritania, from the European Commission Joint Research Centre: European Soil Portal. For more information on the map see the soil resource page. Much of the Mauritania is Saharian desert with dune sands or rocky massifs. Significant vegetation occurs only in a narrow southern Sahelian belt, and this zone contains the only cultivable land. Land Cover Map of Mauritania, from the European Space Agency GlobCover 2.3, 2009. For more information on the map see the land cover resource page. The geology maps on this page shows a simplified version of the unconsolidated (superficial) and the bedrock geology of Mauritania at a national scale (see the Geology resource page for more details). More detailed information on the geology of Mauritania is available in the reports Schlüter (2006), Friedel and Finn (2008) and Friedel, Finn and Horton (2015) (see References section, below). Bedrock Geology of Mauritania at 1:5 million scale. Based on map described by Persits et al. 2002 / Furon and Lombard 1964. For more information on the map development and datasets see the geology resource page. Sand dunes of the Sahara cover about 50% of Mauritaniaʼs surface. The main areas of these unconsolidated sands are shown in the map of unconsolidated (superficial) geology. The only unconsolidated sediments shown on the bedrock geology map are sediments in the coastal zone, forming a Continental Terminal sequence, part of the Senegal Basin. Dune, alluvial and lacustrine sediments Some, but not all, of these sediments are shown on the map of Unconsolidated (Superficial) Geology, above. Such unconsolidated sediments crop out across much of the interior of the country. Dune sands are widespread. Alluvial sands, gravels, silts and clays occur in wadi (ephemeral river) valleys. Lacustrine sediments, including evaporite deposits, occur at the sites of former or ephemeral lakes. the east, interfingering westward with marine sediments deposits (Schlüter 2006). Below this large area of the country are various Palaeozoic sedimentary bedrock sequences, covered by thick unconsolidated Sahara dune sands and other unconsolidated sediments. Where the bedrock sequences crop out they have been differentiated into older (Cambrian-Carboniferous) and younger (Cretaceous-Tertiary) sedimentary sequences, but below this area they are grouped into a single unit that is likely to include a wide range of different sedimentary rocks, both clastic and carbonate. Little is known about these rocks. They may be dominated by sandstone. Zemmour Group (Devonian); Tenemouj Group (Devonian-Silurian); L'Oued Chig Group (Silurian); Tichit and Nouatil groups (Ordovician); d'El Harach Group (Cambrian-Ordovician); d’Oujeft Group (Cambrian) Rock types include greywackes, sandstones, limestones, mudstones, siltstones and dolomites. The oldest rocks include Cambro-Ordovician fossiliferous marine sandstones, overlain by Late Ordovician tillites, graptolitic Silurian shales and fine sandstones, and Devonian shales with reefal limestones (Schlüter 2006). The sedimentary sequence is interrupted by dolerite sills (Friedel and Finn 2008). Igneous rocks cover a very small part of the country. Mostly of Mesozoic and Palaeozoic age. Intrusive Jurassic rocks include dolerite sills and diorites. There are also known rhyolites of Cambrian age (Freidel and Finn 2008). Djonaba, l'Azlaf, Jbéliat, Téniagouri, Aioun, Assabet El Hassiane, Atar, Char, Khaang Naam and El Mreïti groups This unit represents a major and varied series of meta-sedimentary rocks, mostly Precambrian in age but the youngest date from the Cambrian period. Rock types include tillites, dolomites, marine cherts and sandstones, conglomerates, pelites, quartzites, schists and limestones. the southern part, there are schists with granitic intrusions (Friedel and Finn 2008). 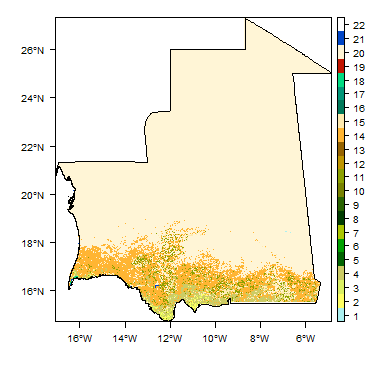 The hydrogeology map on this page shows a simplified overview of the type and productivity of the main aquifers of Mauritania at a national scale (see the Hydrogeology map resource page for more details). A more detailed overview of the hydrogeology of Mauritania is available in the USGS reports Hydrogeology of the Islamic Republic of Mauritania (Friedel and Finn 2008) and Hydrogeologic Map of the Islamic Republic of Mauritania (Friedel, Finn and Horton 2015), which also includes a synthesis of hydrogeological data and a groundwater chemistry map. Also available to download from the USGS are other outputs from this hydrogeological mapping project, including a GIS shapefile of a geological map categorised into hydrogeological units, and a shapefile of water boreholes/wells with data on static groundwater levels, borehole geology and groundwater conductivity (salinity). 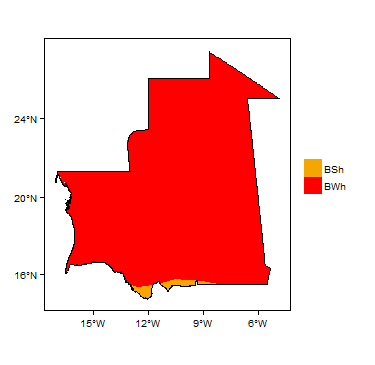 Mauritania has significant groundwater resources, but they are characterised by large geographical variability. 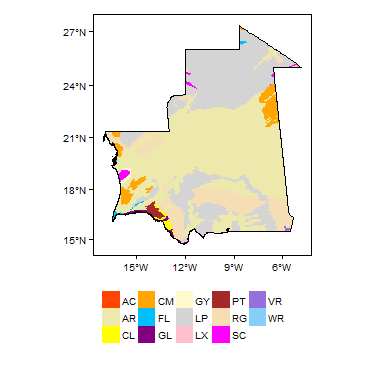 The most productive aquifers are laterally extensive, deep basin-fill sedimentary sequences, particularly the Trarza aquifer in the coastal zone, and the Taoudenni basin aquifer in the south and southeast. Precambrian Basement rocks, in the north and bordering the coastal zone, form low productivity, local aquifers. The dune sands that cover much of the centre of the country are often permeable with high groundwater storage potential, at least locally, but the actual volume of groundwater in them is dependent on rainfall. Trarza - Continental Terminal coastal basin - Tertiary to Quaternary sediments High but Variable Productivity A multilayered unconsolidated aquifer with intergranular (matrix or porous) groundwater flow, and heterogeneous in aquifer properties (transmissivity and storage) and degree of confinement (unconfined, semi confined or confined) over short distances and depths. The variability in aquifer characteristics is controlled by changes in grain size, degree of sorting and consolidation of the sediments. Groundwater is found preferentially in higher permeability sandstone, sand and gravel beds, which are separated by lower permeability clays and silts. For example: in Idini there is a shallow unconfined aquifer from 10 - 40 m depth, with TDS ~ 1000 mg/l; a semi-confined aquifer from 60 - 90 m depth with TDS 150 - 400 mg/l; and a deeper aquifer from 150 - 170 m depth with highly mineralised groundwater (TDS 4000 mg/l) (Lacroix and Séméga 2005). By contrast in the Tiguent-Rosso area the aquifer appears dominated by a main unconfined groundwater with occasional saline bodies. Groundwater is thought to leave the basin primarily through evaporation and by pumping at two major water supply well fields near its centre: 100 km east and 165 km southeast of Nouakchott (Friedel and Finn 2008). Groundwater flows into the aquifer basin from the interior Taoudeni Basin to the east, the Atlantic Ocean from the west, and the Senegal River from the south. Recharge is likely to be restricted by the low precipitation and high evaporation rates (Friedel and Finn 2008). Over-abstraction at the two main well fields appears to have caused cones of depression, drawing down the water table and inducing inland migration of salt water from the Atlantic Ocean, creating a plume of saline water for distances of more than 100 km inland from the coast (Friedel and Finn 2008). Quaternary-Tertiary - dune sands and alluvial valley unconsolidated sediments Probably Low to Moderate Most of these sediments are not shown on the Hydrogeology (Aquifer Type and Productivity) map - they are shown on the separate Unconsolidated (Superficial) Geology map, above. Little is recorded about the groundwater potential of these sediments. They are known to provide small local supplies from hand dug wells. Their potential is likely to be limited by low recharge and, particularly in the case of alluvial valley sediments, discontinuous and localised storage potential. Recharge is likely to be limited by low rainfall. Direct rainfall recharge is the main source of inflow to dune sands. Infiltration from ephemeral rivers is likely to be a key source of recharge to alluvial aquifers. Taoudeni - Cretaceous-Tertiary Possibly Moderate to High Little is known of the aquifer properties of these rocks. Sandstones are likely to be relatively loosely consolidated and therefore dominated by intergranular permeability. They may have relatively high permeability and storage potential, but yields are likely to be limited by low recharge. Recharge is likely to be by direct rainfall recharge and possibly infiltration from ephemeral rivers, and is likely to be low, reflecting the low rainfall and high evapotranspiration rates. Taoudeni - Cambrian-Tertiary Variable - Low to High This large area of undifferentiated sedimentary rocks is likely to show variable aquifer properties depending on geological age and lithology. See the aquifer descriptions for Taoudeni - Cretaceous-Tertiary and Taoudeni - Cambrian-Carboniferous. Taoudeni - Cambrian-Carboniferous Low to Moderate (possibly occasionally High) The consolidated nature of these rocks means that intergranular permeability is generally low, and groundwater storage and flow occur mainly in fractures. Groundwater may occur preferentially in sandstone, limestone and dolomite beds, with intervening less fractured shales, dolerite sills and other lower permeability rocks acting to restrict vertical groundwater flow. In some cases these lower permeability beds may allow some groundwater flow, or may be more or less impermeable, acting to confine groundwater in underlying sandstone beds. Transmissivity values for some of the most fractured and permeable aquifer beds are quoted at 0.05 - 0.1 m2/day (Friedel and Finn 2008). Most is known of the shallow aquifers, to a few tens of metres deep, where limestones and dolomites appear to be reliably capable of providing yields of at least 1 m3/hour, whereas sandstones and shales are only capable of providing this yield in about 50% of cases (Friedel and Finn 2008). Recharge is limited by low rainfall and high evapotranspiration, and for deeper aquifer beds, by the permeability of overlying rocks. Precambrian Metasedimentary Low to Moderate Productivity Groundwater storage and flow occur only in fractures in these rocks, and aquifer permeability therefore depends on the nature and degree of fracturing. Where fracturing is well developed, the rocks appear to form relatively productive local aquifers. Transmissivity values ranging from 0.00004 to 0.7 m2/day have been quoted, with the most permeable zones capable of a yield greater than 1 m3/hour at least 80% of the time, and less permeable zones capable of this yield only around 50% of the time (Friedel and Finn 2008). Precambrian Basement Low to Very Low Basement rocks typically have low to very low aquifer productivity. Groundwater occurrence is largely limited to secondary permeability, such as weathered zones, joints and fractures. The aquifer potential depends on the degree and depth of weathering and associated fracturing, and the saturated thickness (which is strongly dependent on recharge). The weathered aquifers are generally discontinuous and localised. Even where rocks are intensely fractured, most fractures appear to be disconnected between individual rock units, resulting in low transmissivity values. Where the rocks are productive, quoted transmissivity values are between 0.007 and 0.03 m2/day (Friedel and Finn 2008). There is little information on groundwater levels and abstraction rates across the country. A USGS study indicated lowered groundwater levels around the two major abstraction well fields in the coastal basin aquifers (Friedel and Finn 2008), indicating over-abstraction of groundwater in these areas. Selected groundwater quality parameters were interpreted by a USGS study, including bicarbonate, nitrate, sulphate, specific electrical conductivity (used as an indicator of total dissolved solids (TDS) and salinity) and dissolved oxygen (Friedel and Finn 2008). These data are limited and spatially biased to the Continental Terminal Basin (Tertiary to Quaternary unconsolidated marine and continental sediments) and southern portions of the Taoudeni Basin (probably Precambrian Metasedimentary or younger Cambrian-Carboniferous sedimentary aquifers). A summary of the chemistry data is shown in the table below (from Friedel and Finn 2008). 1 Dissolved solids estimated from SEC (specific electrical conductivity) using nonlinear regression relation established for 285 samples. 2 Parenthesis indicates number of values at or below limit of detection. In most of the areas where data were collected, most groundwater was considered fresh (TDS < 1000 mg/l), but there were significant areas of high salinity. The largest relates to a major saline intrusion from the Atlantic Ocean into the coastal basin aquifer, apparently caused by over-pumping at two major water supply well fields. Two smaller areas of brackish groundwater were revealed in the south-central Taoudeni Basin just west of Kipa, and between Kipa and 'Ayoun el Atrous. 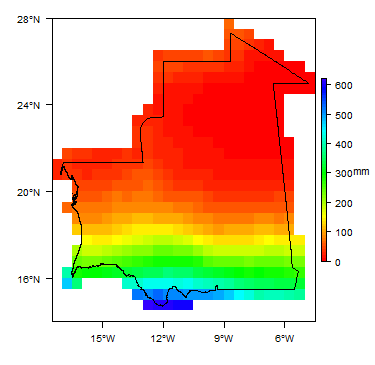 The elevated salinity contours appear elongated in a north-south trend that coincides with apparent groundwater flow paths discharging into the Senegal River (Friedel and Finn 2008 - see also map in that report, Figure 4). Groundwater is abstracted from two major water supply well fields 100 km east and 165 km southeast of Nouakchott, although no pumping records are known (Friedel and Finn 2008). This supplies the major urban centres on the coast. CNRE (National Centre for Water Resources) is responsible for exploration, assessment, monitoring and protection of water resources nationwide. The National Water and Electricity Company (SONELEC), which is a state-owned public corporation responsible for the production, transmission and distribution of water and electricity in large urban centres. 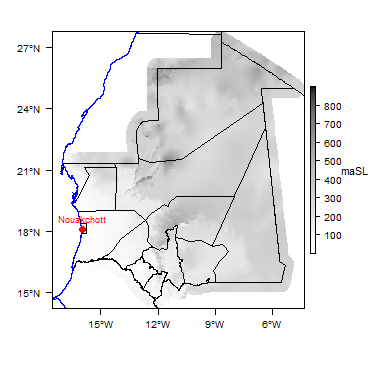 Limited groundwater data are available in Mauritania. A national water point database exists, with entries for nearly 14,000 boreholes and both traditional and modern wells, but has little supporting information (such as geological logs or records of groundwater levels). As part of a project called PRISM (Project for Strengthening of the Institutions in the Mining Sector), from 1999-2004, new geophysical, geological, hydrogeological, hydrological and geochemical datasets were collected, including drilling records and geological logs; spot measurements of static (rest) water levels in boreholes and wells and of groundwater quality; and limited monitoring data for groundwater salinity and borehole pumping rates (Friedel 2008). The following references provide more information on the hydrogeology and groundwater resources of Mauritania. More references may be available through the Africa Groundwater Literature Archive. This page was last modified on 21 February 2019, at 16:40.